- Why Should People Choose Mini Dental Implants? In the modern world, acidic foods have become part and parcel of our regular diet. Whenever we go on food buying sprees in the grocery stores, we are very informed about the fiber content, fat content and even the amount of calories in those products. However, very few of us consider the pH levels in the products we buy. We are completely unaware of acidic foods and the effects such foods can cause on our teeth. According to research that was carried out by a group of top-notch dentists, it was discovered that beverages and acidic foods are the leading contributors to sensitive teeth and enamel erosion. Sport drinks, orange juice, yogurt, sour cream, fruit, pickled products, fermented foods and sodas are categorized as highly acidic foods and cause considerable enamel erosion. Tooth enamel is the outer layer of the teeth and is the hardest part of your teeth; this part is prone to acidic erosion, alternatively known as dental erosion. Dental erosion can be best defined as the irreversible damage to tooth structure due to the dissolution caused by acids. Dental erosion is not caused by acids originating from bacterial action, but solely from the intake of acidic foods. If it continues unchecked, dental erosion might progress from eroding the enamel to the underlying dentin. The teeth become highly sensitive once the dentin is affected; the victim might become highly sensitive to cold or hot food or drinks. Further, the victim might experience excruciating sharp pain on the affected tooth once the nerve endings are reached. Can I Still Enjoy Acidic Foods? The answer is yes, you can still enjoy acidic foods, but under strict moderation and constant teeth maintenance habits. Below are some practices which can allow you to enjoy acidic foods while still maintaining strong teeth. Strong enamel will not be easily worn out and the converse is also true. Enamel can be easily strengthened by eating food rich in calcium. A good example of such food includes milk and other dairy products. Cleaning your teeth regularly removes pieces of food particles left in the spaces between teeth and hence the teeth do not come into contact with the acidic foods for a long time. Using fluoride based toothpaste does not only help clean your teeth but also strengthens them more. This is because fluoride strengthens the enamel, makes your teeth resistant to erosion caused by acidic foods, prevents cavities, and repairs early stage damage of teeth erosion. If you are used to fast and hard tooth brushing, then you are wearing out your teeth enamel making enamel erosion by acidic foods an even simpler task. Ensure that you brush your teeth in a soft and a gentle manner and hence keep abrasive effects at bay. As they say, too much of something is poison. By eating more acidic foods, you increase the rate of enamel erosion. 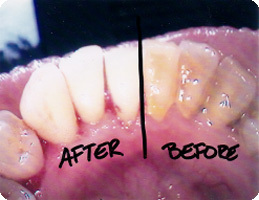 Therefore, knowing and limiting the amount of acidic food intake can be of help in the quest of fighting enamel erosion. Although the use of antacid tablets to counter the effect of acidic foods on the teeth is not recommended, it can be used as a last resort. These tablets neutralize the effects of acidic foods, hence keeping your teeth enamel healthy. However, they might have long lasting side effects. Sexton & Carner, DDS, proudly serves the dental needs of Oregon and the greater Toledo, Ohio area. Copyright © 1996-2018 Sexton & Carner, DDS. All Rights Reserved.